Maggie's Notebook: States to Investigate Lockerbie Bomber Release: Did BP Secure Abdelbaset Ali Mohamed al-Megrahi Release? States to Investigate Lockerbie Bomber Release: Did BP Secure Abdelbaset Ali Mohamed al-Megrahi Release? This week the "doctor" who was instrumental in securing the "compassionate" release of Abdelbaset Ali Mohamed al-Megrahi under the guise of prostate cancer, now says the bomber may live another ten years. The states of New York and New Jersey want an investigation, saying new evidence has surfaced showing al-Megrahi was "not as sick as once believed." This amid speculation that BP had more than a little to do with al-Megrahi's release. Confirming the speculation: The UK Times OnLine reported it on August 15, 2009. About forty-five days later, Al-Megrahi was back in Libya. The short story to whet your memory, Abdelbaset Ali Mohamed al-Megrahi was convicted of blowing up Pan Am Flight 103 over Lockerbie, Scotland in 1988. Everyone aboard died - 259 total. One hundred and eighty Americans met their deaths in the skies over Lockerbie, including 35 Syracuse University students. Abruptly, in October 2009 we heard that a physician, Karol Silora, diagnosed Abdelbaset with prostate cancer and said he had only three months to live. The prison released him back to his home in Libya. The U.S. said little about, but Americans were dismayed. Of course, he didn't die in three months, he didn't die in five months, and now eight months later he still isn't dead, and his diagnosing doctor said it is all very embarrassing that he is still alive...but you know, he might live another ten years. Saif Islam [Muammar Ghaddafi's son] is praising the Brits for making an energy deal that allowed 57-year old Megrahi to come home to Tripoli. Just a side note, when al-Megrahi was in the Scottish prison, he was in a "segregated" area, was believed to have a sitting room, and was served Halal food. His area was known as Gadafi's Cafe. The release of the Lockerbie bomber from prison would liberate Britain’s largest industrial company from a string of problems hampering its $900 million (£546 million) Libyan gas projects, industry sources claimed last night. The close ties between politics and the oil industry in Libya, where 95 per cent of export revenues are from oil and gas, are irrefutable. So, if the Times report is correct, then it is possible Britain needed to find a way for BP's problems with Libya to be resolved, and the release of al-Meghrai happened in exchange for their drilling and exploration to move forward. By the time of the release, Senator Obama, yearning to be President Obama had received $77,051 from BP. He was the "top recipient of BP PAC," - "the largest chunk" of employee's money also went to Obama. The Democrat party received millions from BP. Remember when the U.S. said little about al-Megrahi's release, with Obama telling Scotland it was a mistake. He had to know Britain was behind the release. No one believed Scotland would be willing to make the decision, unless Brits were backing it. It was shocking to some of us that there would not be a sharp retort from the U.S.
Obama asked that Libya downplay the bomber's arrival back to his home country so as not to inflame passions back in the states. 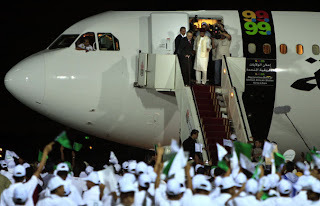 There was a huge celebration underway as the airplane door opened and al-Megrahi appeared to a roaring crowd. That policy of Muslim outreach is a one-way street. Perhaps Obama was paid-off with campaign funds, and the promise for future donations. Perhaps making a fuss about freedom for the murderer of 180 Americans wasn't worth losing donations to Obama's stash. In September 2009, Hillary through the State Department, tried to "disburse $2.5 million in economic aid to Libya. Congress, in one of the few honest moves they have made in the last several years, shut-down that hand-out to Libya. NALCO is associated with the University of Chicago Argonne program. The Obamas both worked for the University of Chicago. UChicago Argonne received $164,000,000 in stimulus funds this past year and just added two new executives to its roster: one from NALCO, the other from the Department of Education. If you dig a little deeper you will find NALCO is also associated with Warren Buffett, Maurice Strong, Al Gore, Soros, Appollo, Blackstone, Goldman Sachs, Hathaway Berkshire. Warren Buffet/Hathaway Berkshire increased their holding in NALCO just last November. (Timing is everything). The dispersant chemical is known as Corexit. What it does is hold the oil below the water's surface. It is supposed to break up the spill into smaller pools. At this time, I believe Corexit is still the only dispersant allowed to be used in the BP oil spill. Its stock took an 18% jump after it became public that it was the sanctioned dispersant. Is this a story? The best source is the Times Online article, in print about 45 days before al-Megrahi's release. Now well see if these New York and New Jersey Senators can get the job done and see a "real" investigation through to the end. It appears their star witness will be alive for awhile...maybe for ten years.